The Veloso family addresses the crowd at Mendiola. Photo by Pinoy Weekly. We have heard this too many times straight from cruel landlords of the largely feudal Philippine countryside – those who break their backs in hard toil deserve only a pittance and must be grateful for the generosity of their masters. Slaving subjects must always keep silent about their plight or be branded ingrates. We refuse to believe that the general public truly share this elite brashness with Aquino and his most rabid defenders. The fight for Mary Jane and for social justice is not over yet, and must continue to seek the broad support of the people. We must not bask in irresponsibly sown divisiveness and intrigue. Hurtful words must not break our unity as an oppressed people seeking justice. Why did the Veloso family refuse to thank Aquino for saving Mary Jane? Only the Veloso family can say for certain how the Aquino government caused them infinite anguish over the five long years that Mary Jane languished in prison abroad. State officials fed them lies and bungled the handling of Mary Jane’s case. It is this unforgivable, criminal ineptitude that practically sent Mary Jane to the gallows. We must also cite the case of OFW Joven Esteva who was executed via beheading in Saudi Arabia last March 9. His family learned about his execution from the media after the fact. Mary Jane could have shared this cruel fate with Joven if the Aquino government had its way. Why did the government hide Joven’s predicament from the public and from his own family? Why is there is no Joven Esteva occupying our collective psyche now like Mary Jane? For Aquino and his officials, Mary Jane is better off as a mere statistic, a nameless sakada’s daughter condemned to death in a foreign land. The people can also find the roots of the family’s plight in Hacienda Luisita. Mary Jane’s story actually started in Aquino’s own backyard. At age 15, Mary Jane’s father Cesar started working as a sakada, or a seasonal sugar cane cutter at the estate, where Cesar’s father, Emeterio also endured hard toil for decades. This oppressive set-up still festering in our countrysides up to this day and age forced the family to find other odd jobs as peddlers and scavengers. This bleak situation compelled Mary Jane to seek opportunities abroad. This is a story typical of every Filipino family amid widespread hopelessness and destitution here in the country. In predictable cacique fashion, Aquino arrogantly said that he did not create Mary Jane’s problem. But Aquino is a scion of one of the country’s biggest landlord families to ever hold state power and Hacienda Luisita is undeniably the face of every known human rights violation in the country. Must we now imitate the twisted reasoning of the powerful to further silence the oppressed? Must we really take part in rubbing salt on the victims’ open wounds? We have heard this before from Aquino. Thousands of Hacienda Luisita sugar workers should not have mounted the unprecedented strike of 2004 to demand decent jobs and wages. They should have been grateful they have become “stockholders” of the Hacienda Luisita Inc., (HLI) due to the benevolence of the Cojuangco-Aquinos and the CARP’s stock distribution option (SDO) scheme. Why complain if they only receive a mind-boggling P 9.50 every pay day as supposed co-owners of the estate? The dead and the wounded are only to blame for the bloody dispersal and massacre that ensued, according to this landlord president and his ilk. Beneficiaries of land distribution in Hacienda Luisita after the 2012 Supreme Court decision which revoked the oppressive SDO scheme must now keep silent on anomalies and violence surrounding the sham land reform process. They must be grateful to the Aquino government for finally awarding them pieces of paper called CLOAs which say that they must now start to pay government for land amortization. They must show gratitude for the expeditious land reform process, lest they be assaulted and arrested. Farmers must be thankful for the CLOAs while their rice fields and huts are razed to the ground by Cojuangco-Aquino goons assisted by the military, elite SWAT teams, and even employees of the Department of Agrarian Reform, the government agency tasked to implement total land distribution. Luisita farmers must not ask for anything more, as far as this cacique dispensation is concerned. 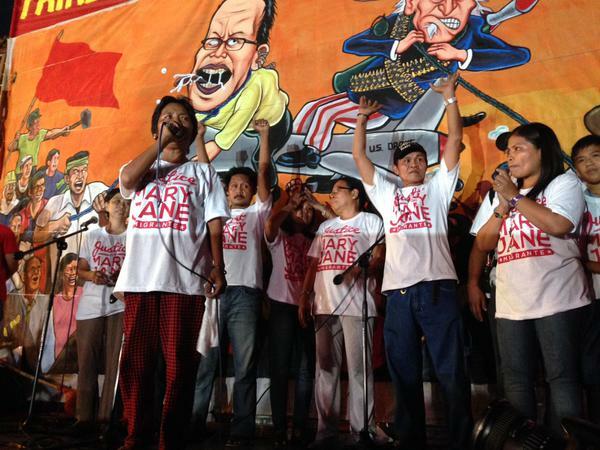 When the family of Mary Jane Veloso went up the stage during the mammoth Labor Day protest in Mendiola, Manila, Nanay Celia and her daughter Maritess poured profuse and heartfelt thanks to everyone who helped them save the life of their dear Mary Jane. Everyone – from individuals who stayed at home to offer prayers, to the various groups and institutions that the family even wanted to enumerate one by one so they may personally convey their gratitude. Anyone present during this sincere outpouring would not dare insult the family with unfair and painful tags reserved by tyrant hacienderos for their defiant subjects. Instead of thanking Aquino, we must unite as a people to hold his leadership accountable. We must learn from Yolanda and Mamasapano and Mary Jane before any other Filipino ends up as another hapless victim. Mary Jane must not be made a trophy to salvage Aquino’s dwindling popularity. There is no other course for the discredited haciendero Aquino but to step down from office. At the Indonesian Embassy in Makati to #SaveMaryJane. Photo by Efren Ricalde. Agricultural workers across the country cheer the people’s triumph, owing to unrelenting efforts which ultimately saved the life of a humble sakada’s daughter, Mary Jane Veloso. Filipinos here and abroad together with supporters from other nationalities stood ground until the very last minute even with the firm stance made by Indonesia against Veloso. The haciendero dispensation led by Benigno Aquino III, however, has no moral authority to claim that the stay in Veloso’s death sentence was due to their efforts. When government was expected to rally the nation to make Indonesia spare an innocent Filipino’s life, intimidation and repression were inflicted by our own police force against Veloso’s sympathizers. Instead of keeping our hopes afloat, our own local officials fed the media with defeatist pronouncements and lies to once again cover up government’s criminal negligence and its bungled handling of Veloso’s case. Aquino was never sincere in saving Mary Jane. His 5-minute appeal to Widodo during the ASEAN summit came to nothing. Bowing to local and international pressure, Aquino made a last minute call to Widodo, only to reveal yet again his brand of cacique arrogance by blaming and practically shaming the victim Mary Jane for “not cooperating with government” early in her ordeal. The callousness of Aquino brings back memories of Flor Contemplacion, who was also treated by officials as a ‘mere domestic worker’, a dispensable pawn. Mary Jane, like the thousands of farmworkers in Hacienda Luisita, was treated by Aquino like trash. 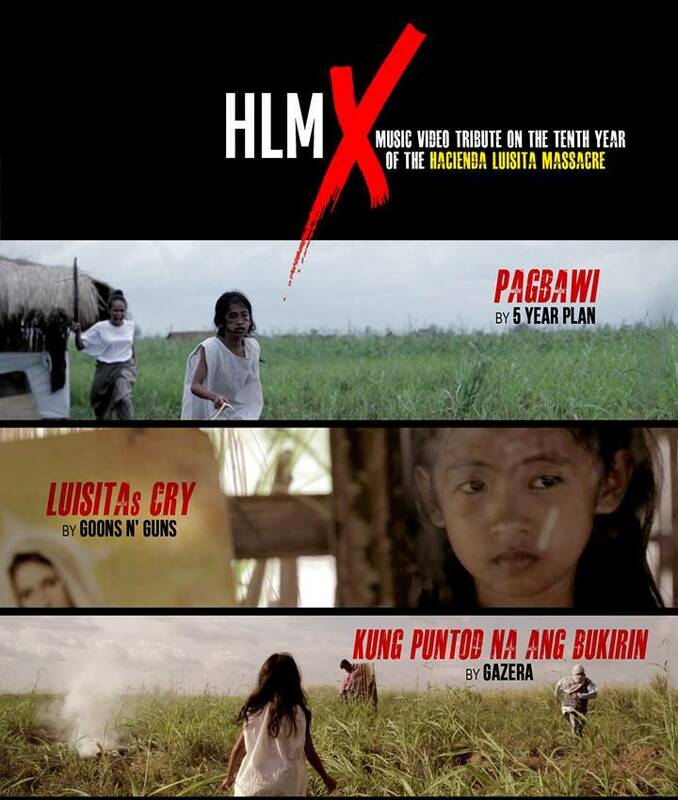 The Hacienda Luisita massacre is a stark reminder of how cheap our lives are for Aquino and his ilk. Hacienda Luisita farmworkers and millions of other sakadas or seasonal workers, agricultural workers and their families across the country remain the poorest of the rural poor most vulnerable to slave wages and forced internal migration. This is where MaryJane’s story began. The Veloso family suffered extreme poverty despite back-breaking toil in sugarcane fields endured by Mary Jane’s father, Cesar, and Cesar’s father, Emeterio before him. Without genuine land reform, the number of impoverished and landless farmworkers will continue to grow. The labor-export policy which feeds on the desperation of our people will continue to produce many other Mary Janes who leave the country everyday. We shall continue to fight for Veloso and the cause of social justice and freedom to save the lives of these Mary Janes, and to save the lives of our people. Agricultural workers led by the Unyon ng mga Manggagawa sa Agrikultura (UMA) demand that President Benigno Aquino III exert stronger effort to appeal for clemency for Mary Jane Veloso, especially since her parents worked for decades at the Aquino-Cojuangco estate Hacienda Luisita as sakadas or seasonal sugar cane cutters. 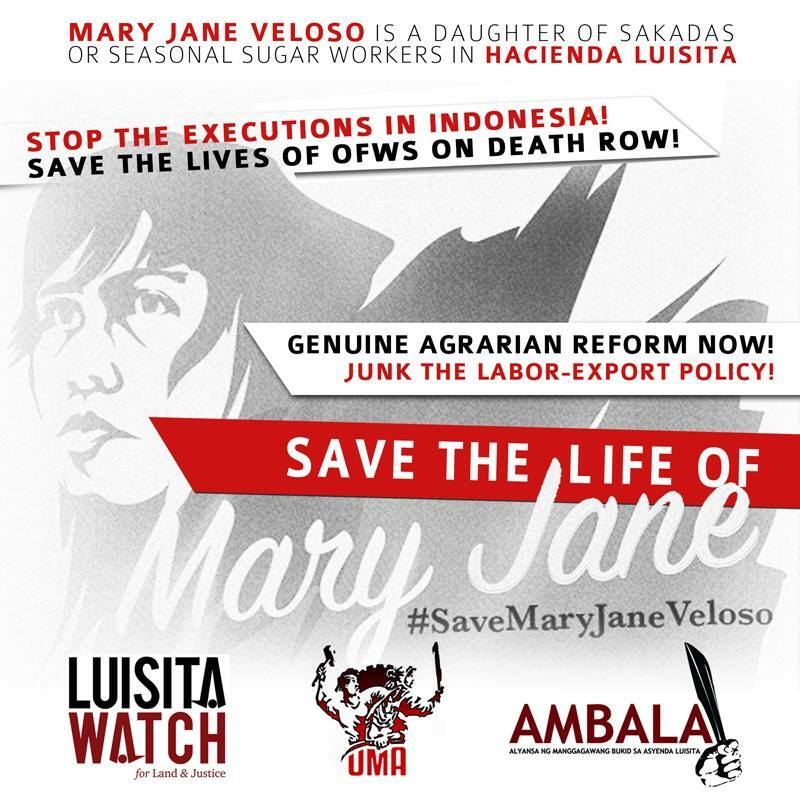 Hacienda Luisita farmers under UMA and the local alliance AMBALA urged Aquino to be more forceful and determined in saving the life of Mary Jane Veloso. AMBALA Chairperson Florida “Pong” Sibayan reminded Aquino that Mary Jane’s father and grandfather’s hard toil as underpaid sakadas in Hacienda Luisita contributed to the Aquino-Cojuangco’s family fortune. “The Aquino-Cojuangcos amassed huge wealth and power through the sweat and blood of sakadas and farm workers like Cesar and Emeterio Veloso. Aquino must remember this when he comes face to face with President Jokowi to seek clemency for Mary Jane,” said Sibayan. 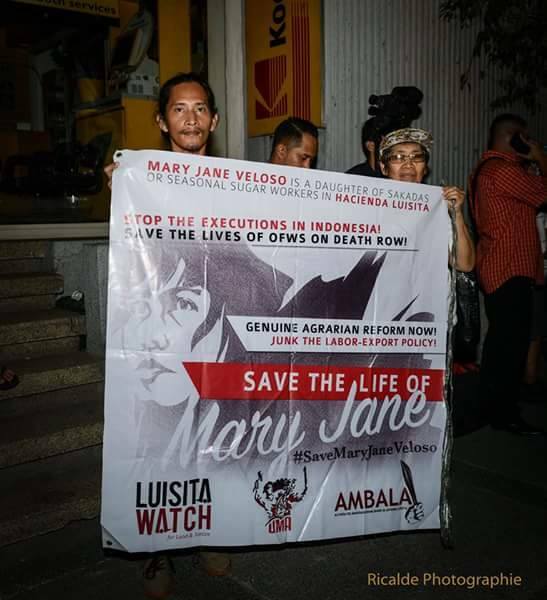 Aside from appealing to Indonesian President Joko Widodo, Aquino should also appeal to other ASEAN leaders to urge the Indonesian leader to stay the execution of Mary Jane. “Aquino should extol French President Hollande whose efforts and strong statements resulted in the delay of the sentence of French national Serge Atlaoui, who is also on Indonesian death row with Veloso,” said John Milton Lozande, UMA Acting Chairperson. “The Philippine government must also warn Indonesia that if its appeal for Veloso is ignored, it is prepared to recall its ambassador from Indonesia just like what Brazil and the Netherlands did after their citizens were executed in January. The Brazilian government even declined to accept the credentials of Indonesia’s new envoy,” Lozande added. “The government’s labor-export policy is another trap that aggravates the dire conditions of peasants and the people under Aquino,” said Lozande. 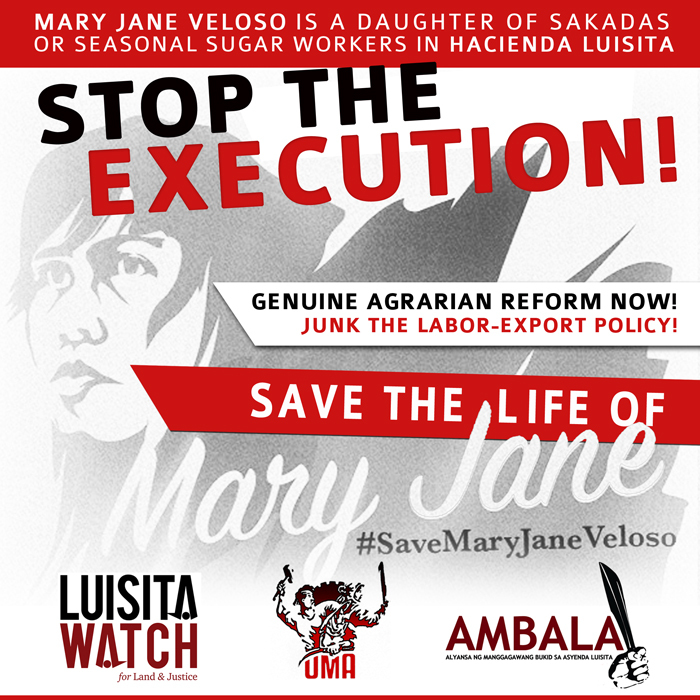 The agricultural workers’ urgent appeal to stop the execution of Mary Jane Veloso was carried by UMA and its affiliate unions and organizations from Cagayan Valley (UMAMI), Tarlac (AMBALA), Batangas (KAISAHAN), Negros Island (National Federation of Sugar Workers), Bukidnon (OGYON), Agusan del Sur (PIGLAS-MAPAPI), Southern Mindanao and Far-South Mindanao (NAFLU-KMU) during its recently concluded national council meeting held in Quezon City. Hacienda Luisita farmers led by the Alyansa ng mga Manggagawang Bukid sa Asyenda Luisita (AMBALA) and the national federation Unyon ng mga Manggagawa sa Agrikultura (UMA) held an ecumenical service and symbolic mass action today at Hacienda Luisita, to stop the execution of Mary Jane Veloso, an OFW in Indonesian death row. The farmers, who have been calling for President Aquino’s resignation over sham land distribution and impunity in Hacienda Luisita, minced no words and declared that the Filipino people including the thousands of disgruntled Luisita peasants will definitely unleash its wrath on Aquino if the worst happens to Veloso. “Nakikiisa kami sa panawagang iligtas si Mary Jane dahil alam namin ang hirap na pinagdaanan ng kanyang pamilya (We stand in solidarity with the call to save Mary Jane because we share the hardships that her family went through),” said Florida Sibayan, AMBALA chairperson. Mary Jane Fiesta Veloso is a sakada’s daughter. Her father, Cesar, was born and raised in La Paz, Tarlac and worked up to the 1980’s as a seasonal sugarcane cutter or sakada. Cesar’s father Emeterio, also worked for Hacienda Luisita. The Luisita estate still employs sakadas during milling or kabyaw season. These almost “invisible” seasonal workers receive slave wages for toiling in the most subhuman working conditions. Veloso’s father Cesar endured heavy toil as cane cutter, he even experienced urinating blood. Pastor Gabriel Sanchez of the UCCP led the ecumenical service for Mary Jane Veloso held at AMBALA’s farm hut in Barangay Balete. Farmers placed white ribbons around the area to symbolize their support for Mary Jane. 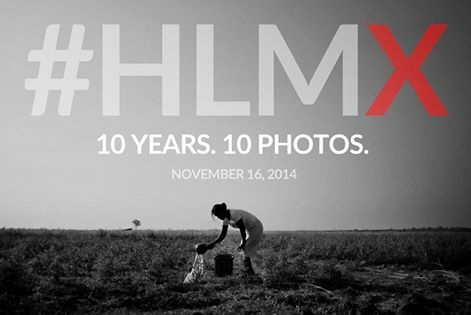 Sanchez is the father of Juancho, one of the farm workers killed in the 2004 Hacienda Luisita massacre. The plight of the Veloso family is experienced by millions of other peasant families denied opportunities to cultivate and make full use of the land they till. Seasonal workers in Luisita are entirely left out of land distribution, while the regular farmworkers still cannot be called lucky “beneficiaries” as the now face landgrabbing, harassment, eviction, and all sorts of deceptive and violent attacks from the Presidential family and state forces. “The government’s bogus and fascist agrarian reform program complemented by its labor-export policy fester on the desperation and destitution of our peasants. CARP and labor-export are like death sentences to our own people,” said Aurelio Estrada, UMA media officer. The groups also condemned the Aquino government for its criminal neglect in handling Veloso’s case. “Aquino if at all acted haphazardly and belatedly, only more than a year after Veloso was sentenced to death,” Estrada said. The Aquino government has not yet even raised the stakes with the Indonesian government to include the cutting of diplomatic ties as an option to save the life of Mary Jane. “Aquino’s lies and repeated denial has only earned the ire of the public. The world knows of Aquino’s deadly blunders – the Luneta stand-off, Yolanda, Mamasapano. Survivors of the Hacienda Luisita massacre know for a fact that the President’s hands are bloodied,” Sibayan added. 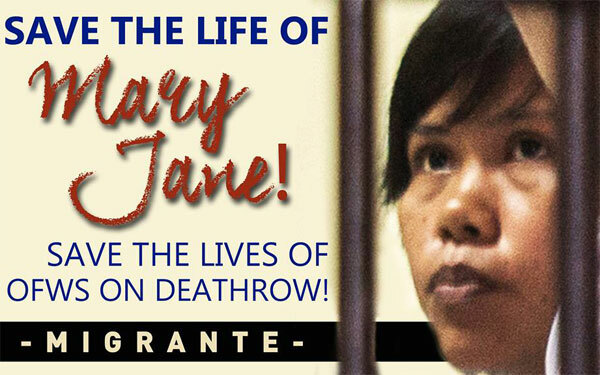 Commute the Death Penalty on Mary Jane Veloso and Other Victims of Human Trafficking! Her father used to be a seasonal sugar agricultural worker (sacada) in Hacienda Luisita and even in Batangas up to the 1980’s. Her mother like him is a landless peasant. The back breaking work and very low pay of a sacada which was immortalized in the movie “Sacada” in the 70’s perpetuate one into endless poverty. The Philippine government should ensure that all legal representations and assistance be provided her. Even if it cannot escape the gross negligence it made by acting belatedly on the case. It should also be castigated for implementing the Comprehensive Agrarian Reform Program (CARP) which only created illusions of reform while actually maintaining land monopoly and foolishly attempting to suppress peasant unrest. Majority of Overseas Filipino Workers (OFWs) come from the peasant class as Mary Jane Veloso. At first she worked in Dubai but cut short her stay there because she was almost raped. Later on she was tricked by a daughter of her godfather into working as a domestic worker in Malaysia which was non-existent. She was made to find work in Indonesia by the same person using a luggage with hidden drugs in it. Many more would become like her as long as poverty is perpetuated by sham land reform programs. Instead the Genuine Agrarian Reform Bill (GARB) should be enacted. Its aim to break up the monopoly of a few landowners and foreign control of agricultural lands, to put an end to feudal and semi-feudal exploitation in the Philippine countryside. Genuine land redistribution must be attended with a holistic program of support services that will empower the peasantry politically, nurture their productive strength and carry the spirit of true cooperativism. Agrarian reform must also be integrated with a program of national industrialization as key to genuine national development. If this is achieved families would not be broken up by the urgent need to survive, because there would be an opportunity for everyone to live a decent and humane life. Commute the death sentence of May Jane Veloso! Hold the Philippine government responsible for her predicament! Stop the Labor Export Policy! Implement the Genuine Agrarian Reform Bill! Appeal for Urgent Action: Save the Life of Filipina Mary Jane Veloso! Stop the Executions in Indonesia!